Cutting through the water, feeling heavenly as you hear the crashing waves against the stone. The purity and fluidity of mother nature is captured in the Tide Case its rippled, faux marble plate. Features beautiful, intricate texture of marble in the colors white and black. Focussed on the essentials, the Tide White Marble & Tide Black Marble stands for minimalism like no other. 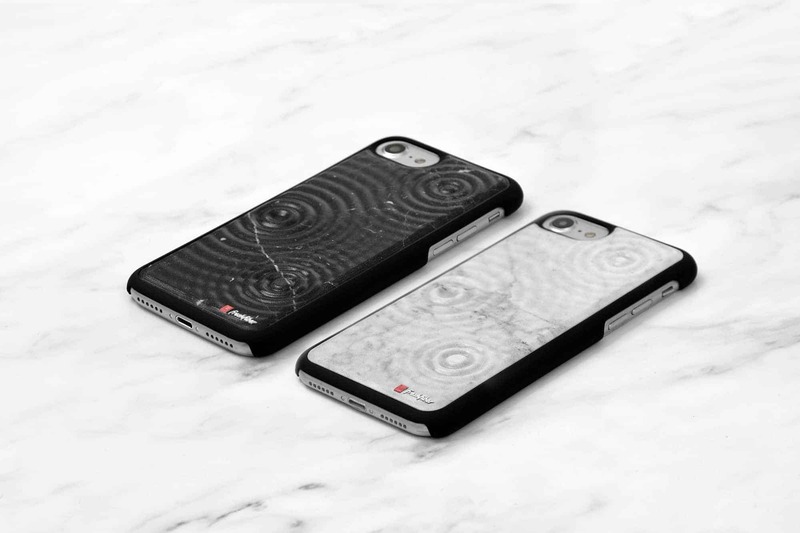 A matte black minimalist bumper combined with a three dimensional plate of monochrome marble makes this case modern, elegant and chic. An essential piece featuring a clean aesthetic. Matthijs Kok his work pivots primarily on an ambition to combine art and design, by working with unique materials and processes, pushing boundaries of material and production possibilities. By having the chance to work with this unique, new printing technology, Matthijs Kok was able to create full color art pieces in 3D. Inspiration for this project is taken from nature, in the form of raindrops falling onto a water surface, creating interfering water waves. The design embeds surface complexity and refraction, appearing the marble to be transformed from static to fluid by the subtle waves and ripples, frozen in time. People were fascinated by the combination of the 3D ripple texture applied to the faux marble plate. The rippled surface reflects light in a dynamic way, creating a subtle fluid dynamic. This intricate texture, applied to the marble surface creates an unexpected contradicting look and feel, desirable to touch.